Product pages are arguably the heart of an ecommerce website. It’s where potential customers learn about your products in a guided conversation that should deliver value and an overall top-notch customer experience. Consequently, the elements on those pages are also potentially where you’re losing conversions due to anxiety. So how do you identify and mitigate anxiety on product pages? In this MarketingExperiments Blog post, I wanted to share a recent experiment where an e-book retailer asked that same question and started testing to discover a way to answer it. But, before we dive in, let’s view the background notes on the test to put the experiment into context. Background: A large e-book retailer. Goal: To increase the overall number of e-book sales. Research Question: Which attempt to reduce anxiety will result in the highest conversion rate? 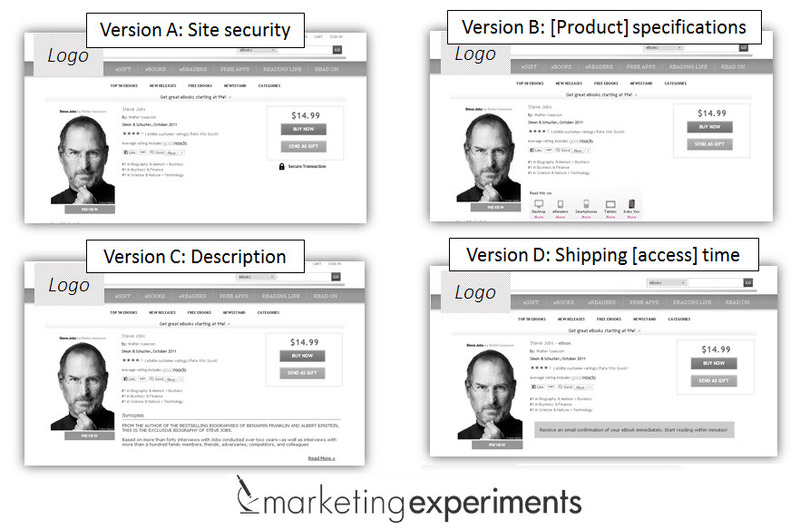 The team hypothesized that testing key product page elements could help them determine the true impact of anxiety on a product page. Moving the product description up on the page resulted in a 78% relative increase in conversion. Anxiety is lethal to conversion. However, it can often be corrected with strategic changes to product page elements that mitigate anxiety by overcorrecting for it. But before you do that, you have to test your way into identifying, isolating and optimizing those elements that are having the biggest impact to conversion. What did the control look like? I’m a little surprised by the result, but I love the methodology of testing the different anxiety points the shopper could experience. Thank you for sharing! I hope this helps your marketing efforts, thanks for commenting! I guess the next stage would be to split test synopsis, as its an e-book I would even go a stage further and modify and split test the e-book based on findings of the synopsis a/b tests. Now that would be true digital marketing!